Catch us if you can is the message from Peterhead defender Jason Brown as his side bids to pile the pressure on their rivals in the race for the League 2 title. The Blue Toon are five points clear of Edinburgh City and seven clear of third-placed Clyde as the race for the championship enters the home straight. Jim McInally’s side fell short to Montrose after failing to catch the Gable Endies in the closing weeks of the campaign and having helped his side put distance between themselves and their title rivals Brown is eager to press home the advantage in the coming weeks. He said: “It’s definitely a nicer feeling to be top of the table compared to chasing. We want to be top of the pile rather than the team looking at results elsewhere and hoping another team does them a favour. “It’s in our own hands now and with nine games to go we are counting them down. We’re taking it game by game and we know if we keep picking up the wins then nobody can catch us. 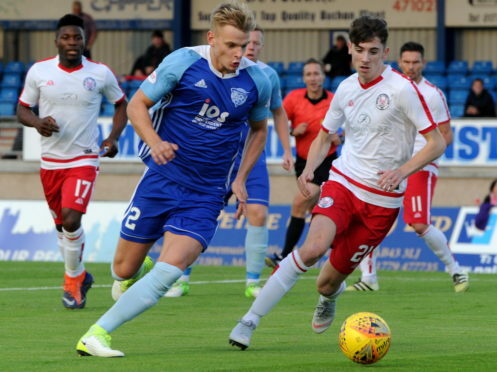 The Blue Toon played their final midweek fixture of the campaign on Tuesday and they made their midweek fixture count as two goals from captain Rory McAllister and fellow striker Shane Sutherland gave Peterhead a 3-1 win against Cowdenbeath at Central Park. Brown insists there is still room for improvement, however. He said: “It’s nice knowing we can prepare Saturday to Saturday for the rest of the season and having a normal routine will help us for the run-in. The Blue Toon welcome Annan to Balmoor today knowing the visitors were the last side to beat them when they ran out 3-0 winners at Galabank on January 26. Brown has not forgotten that day and is eager to make amends this afternoon. He said: “Annan was our worst performance of the season. We were not at the races at all that day and they punished us for it. We haven’t forgotten that feeling and it has given us extra motivation for when they come to our place on Saturday. We want to show the real Peterhead and put that result right.